To Biscaya on the "Ships starting with B" page. Picture received from Sverre Johansen, Norway. Built by Kaldnes mek. Verksted, Tønsberg in 1939. July 9 Boston Halifax July 11 BX 28 See also Page 3. July 26 Halifax Liverpool N.S. July 28* XB 31 *Page 3 gives arrival July 26. Aug. 25 Sydney, C.B. Greenland Sept. 8 SG 6S Page 3 gives arrival Ivigtut (via Bluie Bay?) Sept. 12. Oct. 1 Halifax New York City Oct. 4 ON 131 Convoy will be added. Nov. 19 New York City St. John's, N.F. Nov. 24 HX 216 For St. John's, N.F. Jan. 22 New York City St. John's, N.F. Jan. 28 HX 224 For St. John's, N.F. Sept. 2 Loch Ewe St. John's, N.F. Sept. 13 ON 200 Convoy will be added. Onward to Havana from Key West. (stop at Halifax not mentioned, Page 5). March 9 New York City St. John's, N.F. March 16 HX 343 Returned. "D/S Biscaya was stopped (two shots from the deck gun) by the German submarine which had sunk the Swedish steamer Gustaf Adolf and was ordered to take aboard the crew from the Swedish vessel. The sub had taken the lifeboats in tow initially. The crew were landed at Moss, Norway by the Biscaya". The external website that I've linked to at the end of this page has more info. On March 6-1940, Biscaya is said to have received damages to 2 plates following a collision with a warship when leaving Gibraltar for Nice - no further info is available. According to Page 1 of the archive documents, she was in Marseilles when war broke out in Norway on Apr. 9-1940. Her 1941 voyags also start on this document and continue on Page 2 (it'll be noticed, that she had quite a long stay in St. John's, N.F. at the end of that year, before proceeding to Greenland in Jan.-1942). Page 3 shows a long stay in Philadelphia in the spring of 1942 and again in Greenland later on. Together with the Norwegian Belinda, Havmøy and Sevilla, she's mentioned in connection with the Halifax-U.K. Convoy HX 198 in July-1942. Please note, however, that she was not en route to the U.K. at the time, in fact, she was not even part of this convoy. From Page 3, we learn that she did leave Halifax on the same date as HX 198, July 12, but is listed in Convoy HJ 8 to St. John's, N.F., as are Sevilla and Havmøy (external link). My information for HX 198 is based on a diary, and it's possible that the person who saw Biscaya leave port at the same time as the other ships simply assumed that she was also intended for this convoy. She arrived St. John's on July 15. The following month, she made another voyage to Greenland (convoy info in the table above). In Oct.-1942 she's listed in the westbound North Atlantic Convoy ON 131*, which originated in Liverpool on Sept. 18 and arrived New York on Oct. 4. Biscaya, however, was not present from the U.K., but joined the convoy from Halifax, having left on Oct. 1. Other Norwegian ships listed in this convoy are Abraham Lincoln (Commodore Vessel), Brasil, Ferncourt, Helgøy, Høegh Scout, Katy, Thorshøvdi and Vardefjell. Biscaya now remained in New York for several weeks - again, see Page 3. She's listed, with final destination Greenland, in the original Advance Sailing Telegram for Convoy HX 215 from New York on Nov. 11, but it looks like she did not sail, or returned to port, because she shows up again in the next convoy on Nov. 19, HX 216. According to the Commodore's notes, she left the convoy in the morning of Nov. 24 in order to go to St. John's, where she arrived that same day (carrying Army stores and general cargo). As can be seen in the Voyage Record, she subsequently joined a convoy from there to Greenland at the beginning of Dec.-1942, returning to St. John's later that month, arriving Dec. 27. She left St. John's again on Dec. 29, joining Convoy ON 155, which had originated in Liverpool on Dec.-19. Eglantine and Acanthus are named among the escorts. According to the Commodore's narrative for ON 155, Biscaya joined at 08:00 on Dec. 31; she arrived New York independently on Jan. 6-1943, having straggled from the convoy on the 3rd. Biscaya is also listed in Convoy HX 223 from New York on Jan. 14-1943 (Nortind and Kollbjørg were sunk - follow the links for details), but either did not join or returned to port, because she shows up again in Convoy HX 224, departing New York on Jan. 22 (Page 3). Her final destination is again given as Greenland, and she left the convoy for St. John's in the afternoon of Jan. 27, in order to join Convoy SG 19 for Greenland on the 29th (external link). She later had a narrow escape when U-223 (Wächter) attacked this convoy about 150 miles west of Cape Farewell, Greenland (59 22N 48 42W) with five single shots at 04:52 hours on Feb 3-1943. Two of them hit the Dorchester and sank her with the loss of 673 lives (ref. link at the end of this page). The other torpedoes missed Biscaya and the Norwegian D/S Lutz (Lutz and Dorchester had also been in HX 224 from New York, and left the convoy for St. John's on Jan. 27 together with Biscaya and Alcedo). Robert Cressman, "The Official Chronology of the U.S. Navy in World War II" (see link to "Hyperwar" at the end of this page) has an entry for Febr. 3-1943 where he says Convoy SG 19, bound for Greenland, was escorted by Coast Guard cutters Tampa (WPG-48), Escanaba (WPG-77), and Comanche (WPG-76), adding that Dorchester was chartered by the War Department. Casualties are given as 675 men, including 15 of the 24 Armed Guard sailors. He adds "four Army chaplains, representing four different faiths, bravely give up their lifebelts to soldiers who have none; all four perish with the ship". He also says that Biscaya was damaged in this attack. Her subsequent voyages are shown on Page 3 (showing a long stay in Boston in the spring of 1943) and Page 4, with convoy information in the Voyage Record above. At the end of July-1943 she made a voyage from New York to Iceland with Convoy HX 250, arriving Reykjavik on Aug. 11 (having been detached from the convoy in the morning of Aug. 7, see the Commodore's notes), later travelling from there to Loch Ewe in Convoy RU 87 on Aug. 26 (the original convoy document gives her final destination as New York, as does the archive document). She now headed back across the Atlantic in the westbound Convoy ON 200*, which originated in Liverpool on Sept. 2 and arrived New York on the 18th; according to the archive document, she arrived St. John's, N.F. on Sept. 12, having sailed from Loch Ewe Sept. 2. She had again been in the company of several Norwegian ships, namely Bralanta, Buenos Aires, Emma Bakke, Fagerfjell, Haakon Hauan, Herbrand, Ivaran, Laurits Swenson, Norden, Norheim, O. B. Sørensen and Reinholt, as well as the Panamanian Norbris, which had Norwegian managers and is, therefore, included under the N's on this website. As can be seen in her Voyage Record (and Page 4), Biscaya did travel to New York later on, where she took on board a general cargo for Havana, Cuba, arriving Havana on Nov. 4. Again, see the archive document for info on her subsequent voyages; her 1944 voyages also start on this document and continue on Page 5 (convoy information in Voyage Record). That year she very nearly collided with a convoy, a voyage which could easily have been her last, considering the fact that she had bombs in all her holds as well as 400 tons mustard gas in 20 liters containers. She was on charter to the American Army and in service between the various bases in the Caribbean and New Orleans at this time, and had departed San Juan on May 18-1944 for New Orleans, travelling alone (her cargo being far too dangerous for her to be in a convoy). Radio Operator/Mate Ola Johansen (formerly of M/S Heimvard and D/S Hardanger) was on night duty, and upon seeing the frantic light signals in morse code ahead in the dark, "Convoy ahead, get out of the way", he managed to order the necessary maneuvers to steer clear of the convoy before it was too late. Biscaya arrived Guantanamo on May 20, proceeding to Key West and New Orleans 4 days later (Page 5 - this document also shows another voyage to Greenland that fall - convoy info in Voyage Record above). Skipping now to March-1945, when A. Hague has included her, with a cargo of timber, in the eastbound North Atlantic Convoy HX 343*, departing New York on March 9. She was bound for Liverpool, but went into St. John's on March 16, later joining the slow Convoy SC 170* from there a few days later - her voyages in this period are shown on Page 6. Other Norwegian ships in the HX convoy were Brimanger, Katy, Noreg, Skaraas, Skotaas and Tai Shan, while Askepot, Brønnøy, Brush, Chr. Th. Boe, Frontenac, Geisha (Commodore Vessel), Romulus, Tercero and Titanian are listed in the SC convoy, which had originated in Halifax on March 17 and arrived Liverpool on the 31st; Biscaya stopped at Belfast Lough that day, having sailed from St. John's on March 19. Judging from the information on the archive document, it looks like she later spent a long time in Manchester. She got to go home to Norway already in June-1945, making several voyages home before that year was over, and again at the beginning of 1946 (Page 6 and Page 7). * The ON convoys will be added to individual pages in my Convoys section; in the meantime, the ships sailing in them (and escorts) are named in the section listing ships in all ON convoys. The entire HX series and SC series will also be updated and completed, including the already existing convoys (some have already been updated), but for now, see ships in all HX convoys and ships in all SC convoys. Sold in 1955 to Finska-Nordamerika Line, Helsinki, and renamed Tammerfors. Sold in 1958 to Finska Fiskeri A/B (manager A/B R Nordstrom & Co O/Y, Lovisa, Finland) and renamed Maria. Sold in 1964 to Maria Compania Naviera de Vapores SA, Panama (Greek flag). 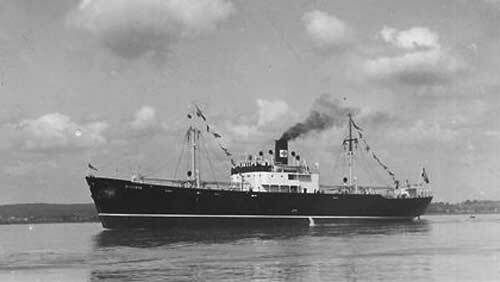 Sold in 1968 to Brodospas, and on May 17 sailed from Piraeus in tow for Split, Yugoslavia, to be broken up. Compare with the information found on this external page. List of Greenland Convoys - SG 19 is included. Here's the the main page. See also the links to A. Hague's listings provided within the Voyage Record above. Hyperwar - Linked directly to Robert Cressman's book entries for 1943, scroll down to Febr. 3. Back to Biscaya on the "Ships starting with B" page. Here's another Biscaya (external link), lost in 1896. There was also a German ship named Biscaya, owned by John T. Essberger. Captured in the North Atlantic in Oct.-1939 by Northern Patrol vessels and sailed for the Ministry of War Transport from 1940 as Empire Unity ("The World's Merchant Fleets 1939"). The text on this page was compiled with the help of: "Nortraships flåte", J. R. Hegland, "Krigsseileren" No. 3 and No. 4 for 1985, E-mail from Tony Cooper, England and misc. - ref My sources.